1stoplighting, online at 1stoplighting.com, is the 1 stop shop for all your lighting needs. 1stoplighting offers a huge array of different lights and lighting fixtures for every room in the house. Among the lighting that 1stoplighting has to offer there is ceiling lighting, wall lighting, lamps, bathroom lighting, and outdoor lighting. 1stop lighting even offers a selection of fans, and home furnishings. Pick from among the top brands at 1stoplighting including Elk lighting, Access lighting, Sea Gull Lighting, Tech Lighting, Golden lighting, Craftmade lighting, and so much more. So when you are in need of lighting just make 1 quick trip to 1stoplighting to find everything you need. Be sure to check out RetailSteal to find the best 1stoplighting discounts, 1stoplighting promotions, and 1stoplighting coupon codes. 1stoplighting charges a flat rate shipping fee depending on the total of your order. Products are shipped to the US states as well as many Canadian destinations via UPS and Fedex. International shipping is not available. See website for full details, exclusions may apply. Act now and save 20% off your entire order with this coupon code from 1STOPLighting. Use our coupon code at 1STOPLighting to enjoy a 5% discount on your online purchase. Head on over to the lighting sale at 1STOPLighting.com and save up to 60% on sconces, ceiling lights and fans, and more lighting for home. Spend $49 or more at 1STOPLighting and enjoy free shipping on your order. Click here to shop. Enter this coupon code on 1STOPlighting to save 20% on your purchase of Designer Fountain Lighting. Shop at 1STOPLighting and enjoy 20% savings on Designers Fountain Items. Click here for code. Shop at 1STOPLighting and enjoy 15% savings on Savoy House Outdoor Lighting. Click here for code. Shop at 1STOPLighting and enjoy 10% savings on all Maxim and ET2 Flush and Semi-Flush Mounts. Click here for code. Shop at 1STOPLighting and enjoy 10% savings on the Monte Carlo Line. Click here for code. 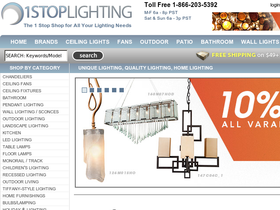 Enjoy 10% off your purchase from 1STOPLighting when you enter this coupon code at checkout. Shop at 1STOPLighting and enjoy 10% savings on Crystorama Blown Glass Fixtures. Click here to shop.